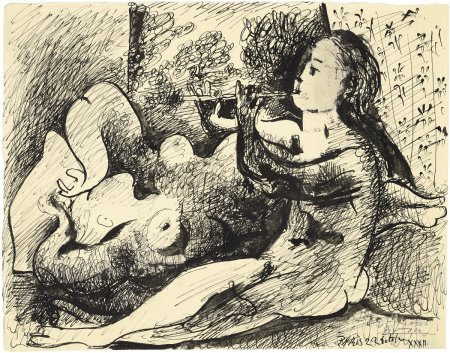 A pen and India ink drawing on paper by Pablo Picasso from the collection of New York’s Museum of Modern Art comes up at Christie’s, Paris on March 28. Dating from October 1932 the work is part of the important but little-known series of India ink on paper addressing the theme of Joueurs de flûte et nus couchés. The drawing underscores the amorous excitement Picasso felt in that pivotal year, as illustrated in the exhibition Picasso 1932 – Année érotique held at the Musée Picasso in Paris and at the Tate London in 2017-2018. The drawing was gifted by the artist to his dealer Daniel-Henri Kahnweiler, before being donated to MoMA by American painter Eve Clendenin in 1961. It is being sold to benefit the MoMA acquisition fund. Treasures from The Congo such as a beautiful Yaka head rest will come up at Christie’s Paris on October 30. The 30 works from the collection formed by wealthy Belgian industrialist and art collector Adolphe Stoclet- whose interests included mines in the Belgian Congo – in the opening decades of the 20th century have passed by descent in his family and have not been on the open market. The Yaka head rest is one of the best of its kind to remain in private hands and is estimated at 300,000-500,000. Also from the Republic of Congo is an important Luba-Shankadi stool (300,000-500,000) and a Kifwebe mask from the Songye (200,000-400,000). 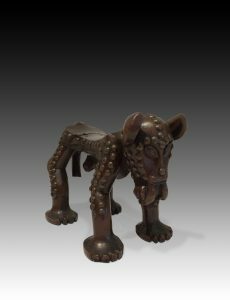 There are ten Congolese works of art in ivory including a Yombe statue and a Boa spoon. The Stoclet Palace in Brussels is considered the masterpiece of pioneering Viennese architect Josef Hoffman. 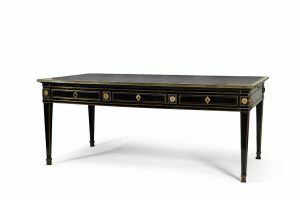 Built between 1905-1911 and considered one of the most refined and luxurious private houses of the 20th century it had a dedicated Salon Africain which contained the 30 pieces to come to auction. This was the first residential project of the Wiener Werkstatte co-founded by Hoffman in 1903 and its interior includes mosaic friezes designed by Gustav Klimt and work by Koloman Moser and Franz Metzner. Though not open to the public the building became a UNESCO World Heritage Site in 2009. 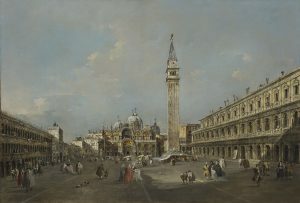 A magnificent view of the Piazza San Marco, with the basilica and the campanile by Francesco Guardi sold for 6.7 million at Christie’s in Paris today. This was the highest price achieved for an Old Master painting sold at auction in France over the past two decades. The Guardi was the top lot in the sale in the Boniface de Castellane and Anna Gould “A Way of Life” sale which achieved 14.2 million. Christie’s said that this exceptional result reflected the relevant choices Boni had made when furbishing his legendary Palais Rose with the most exquisite works of art. There were bidders from 19 countries across five continents. 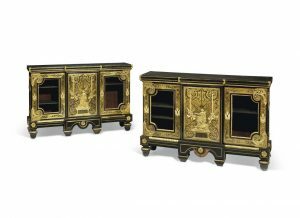 The Palais Rose’s famous Boulle furniture achieved strong prices, as illustrated by the Louis XVI pair of meubles-à-hauteur-d’appui by Etienne Levasseur and Adam Weisweiler which sold for 818,500 and the Louis XIV console attributed to André-Charles Boulle sold for 506,500. 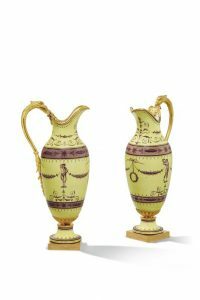 Important decorative art from the period also performed very well, as shown by the Sèvres porcelain “vases” which realised 206,500 against a presale estimate of 80,000-120,000. Art Déco works by Cartier where among the highlights of the sale. 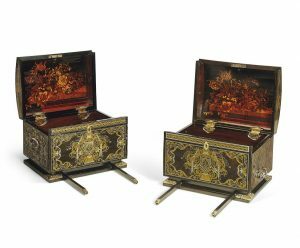 The ‘Jardin Japonais’ desk set made 1.1 million, a new record for an object by Cartier sold at auction. 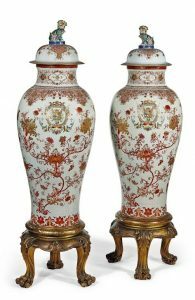 The sale of contents of the Palais Rose in Paris by Christie’s on March 7 will give collectors and connoisseurs an opportunity to acquire Old Master paintings and drawings, fine furniture, porcelain and jewellery. Christie’s will offer the collection of Boni de Castellane & Anna Gould, legendary figures of the late 19th and early 20thcenturies. Boni de Castellane, a celebrated dandy of the Parisian scene, married Anna Gould, daughter of an American millionaire who made his fortune in railways, in 1895. Their Palais Rose was completed in 1902 and hosted some of the most celebrated parties in Paris with guests including the Queen of Naples, Queen Isabel II of Spain, Kapurthala’s Mahardjah and the Kings of Spain and Portugal in 1905. Anna Gould filed for divorce in 1906, mainly due to the exorbitant expenses he had generated. 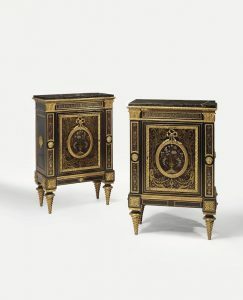 Diane de Castellane lived in this home surrounded by treasures, the majority of which she had inherited from her grandmother Anna Gould, and of which the impressive collection of Boulle furniture is the most significant of all. (All images courtesy Christie’s Images Ltd., 2017). 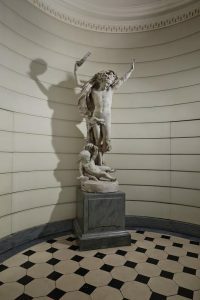 A sculpture by Carpeaux for the facade of the Opera Garnier in a interior by Emilio Terry will feature at the sale of An Exceptional Collection by Christie’s in Paris on September 15. Set to take place during the Biennale des Antiquaires the auction is an opportunity to view an exquisite collection in a beautiful interior. 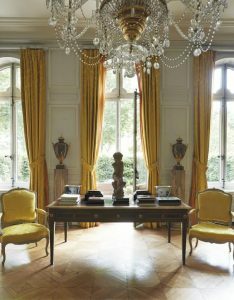 The décor of this hôtel particulier was created by Emilio Terry. It includes several masterpieces assembled across three generations. Le Génie de la Danse was executed by Jean-Baptiste Carpeaux to highlight the Opéra Garnier’s façade and Terry designed the setting in which it fits. 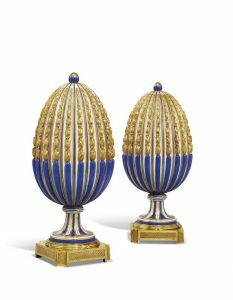 Simon de Monicault, Head of the Furniture and Works of Art department, Christie’s France, adds: “Collections that were laid out by Emilio Terry, major decorator of the 20th century, rarely come to the market. This beautiful hotel particulier has remained intact since Terry’s work in the 1960’s, and grandly brings together 17th and 18th century masterpieces and the neoclassic décor, so characteristic of his work. Pieces have continually been selected by the collectors to fit Terry’s setting, as shown by the works of Christian Bérard and Jean-Baptiste Carpeaux, acquired directly from the artists”. Around 200 lots will come under the hammer in a sale estimated to bring in around four million euro. Génie de la Danse, executed circa 1865-75 by Jean-Baptiste Carpeaux (1827-1875) (600,000-1,000,000). Courtesy Christie’s Images Ltd., 2016.